IDL offers a variety of ways to organize your code. This topic covers some of the methods we have seen that work well and consistently. You could choose to organize your code in other ways, though, so select a method that makes sense and is easy to use. Our strongest recommendation to organize your code is to use projects. 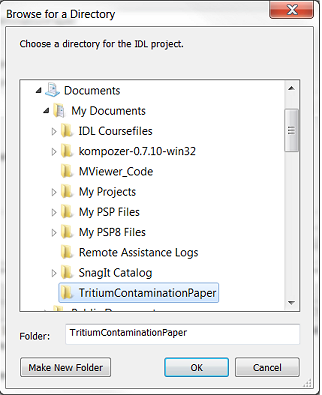 Make sure your projects are tied to unique folders or directories that exist outside of IDL's program files area. If you link projects to folders or directories inside the program files area, you may lose them during an IDL upgrade. Do not store anything in the "Default" project that you want to keep. Use "Default" as a scratch space or a sandbox. Files stored in the "Default" project can be lost during an IDL upgrade. In the IDL Workbench, projects are a way of organizing your files. Logical groupings of related files make it easier to keep them organized, or compile code and build larger programs. We recommend creating directories on your computer or network to hold related IDL source code for tasks like a programming project or a scientific paper. You can then link these directories to the IDL Workbench with a project. Think of a project as being equivalent to these directories - logical groupings of related files. Stay organized: keep related code and supporting files together. Cleaner, more efficient builds: build an entire project at once rather than compiling .PRO files individually. Set the compile order for the Project, as well as other preferences used during the build process. Make it easier to export/share related files. You can use projects to manage IDL's path. An "open" Project is in the path and a "closed" project is not. This also gives you a visual indication of what is in the current IDL path. We recommend this so that when you upgrade IDL, you will avoid the need to move your existing .PRO files to the new IDL workspace or new "Default" project. Place routines that you consistently reuse in a separate directory and link them to a project. Keep this "library" project open so you can always access these routines. Keep all code for a single paper for publication in one project (for example, each .PRO file creates a new figure for the finished paper). Keep all program files for a single programming deliverable together in one project. This makes performing a full build on the program easier. In this demonstration, we will walk you through creating a project to hold .PRO files for a paper we will publish on Tritium Contamination. 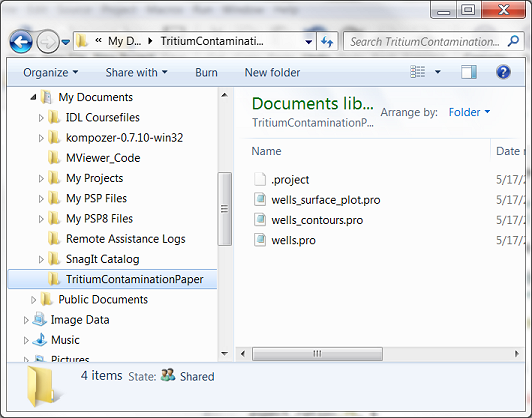 Next, create the project from the IDL workbench and connect it to the folder we just created on the local computer. Click the "New Project" icon in the Workbench's toolbar. Note that both windows display the .PRO files we created previously. 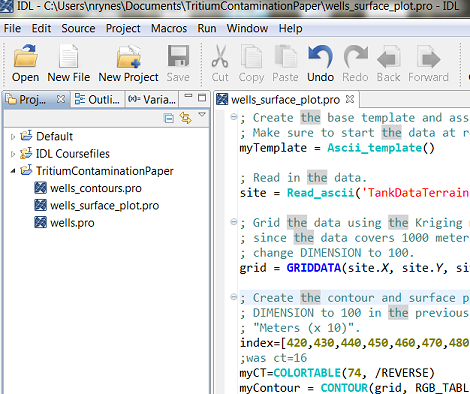 Additionally, the file browser displays a file created by the IDL Workbench called ".project". This file contains IDL-specific information about the project. IDL gives you many ways to manage your path. Using projects is one way that we have found works well and gives you a real-time, visual indication of your current path in the IDL Workbench. 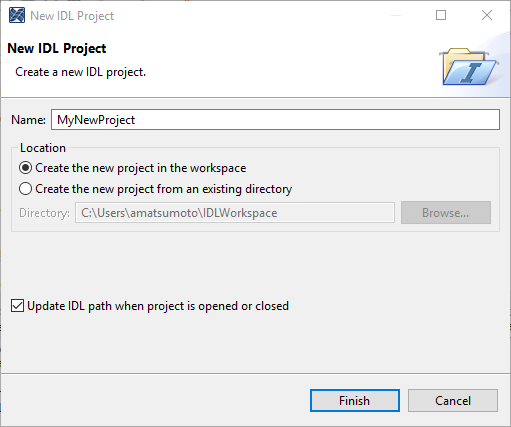 By default, if a project's folder is "open" in your IDL Workbench's Project Explorer, then its underlying directory on your computer is automatically included in your IDL path. Conversely, if a project's folder is "closed," then its directory is not included in your IDL path. Note that you can override this behavior when creating a project.